The OMYL-RH23 and OMYL-RH23E are robust devices capable of logging temperature, humidity and barometric pressure readings and are software configurable to record either all three of these parameters or just individual variables. 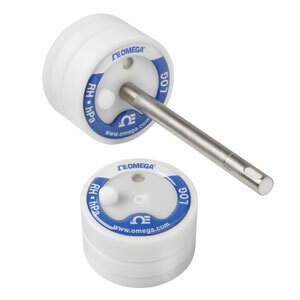 These data loggers are available with standard memory of 100,000 readings (OMYL-RH23, OMYL-RH23E) or expanded memory of 4 million readings (OMYL-RH23-4M, OMYL-RH23E-4M). The OMYL-RH23/OMYL-RH23-4M have built-in sensors for temperature, humidity and barometric pressure. The OMYL-RH23E/OMYL-RH23E-4M have an internal pressure sensor with the temperature/ humidity sensors fitted in an integral 100 mm (3.94") steel probe. These data loggers are suited for a variety of applications including environmental or climate studies, meteorological research and also in clean rooms and laboratories. Nota: Comes complete with 3V lithium battery (standard temperature range), 1.8 m (6') USB interface cable and OMYL-SOFT software, and operator’s manual on USB stick.